Happy Birthday to me!! 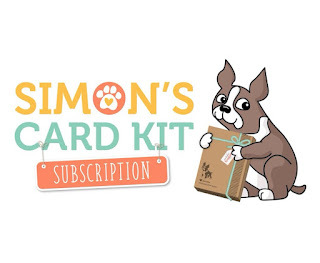 and what better way to spend a special day than opening up the latest Simon Says Stamp April Card Kit and have a play! These kits do sell out super fast so if you want to make sure that you don't miss out you really do need to subscribe. they are terrific value for money! This kit has already sold out, but you are still able to buy most of the items individually. A few people have asked me to do a tutorial on how to make a shaker card. For this card I have used the traditional 3D adhesive foam method and I will be back next time with how to make one using a Fuse Tool. I really love the Butterflies Stencil in this set and used the Squeezed Lemonade Oxide Ink and the new Tim Holtz Blending Brush to apply some colour, after taking this pic I also used a little Worn Lipstick Oxide Ink (which was in a previous kit) to add a little extra shading. I applied the inks to both a background piece of paper and a die cut panel to make the butterflies continue throughout the shaker. I dabbed the Mermaid Lagoon Ink onto a craft sheet and spritzed with water. I then picked up the watery solution with a Tim Holtz Splatter Brush to add more color and interest. Now I started to put the shaker together, I cut a 2nd piece of card, slightly smaller than the front and cut out an oval aperture so that it fits directly behind the front panel, this reinforces the panel and prevents it from warping in the mail. I fixed a panel of acetate to create the window and then used 3D foam tape all around the edges and popped in triangles of tape into the corners, this not only strengthens the panel but prevents any shaker contents from escaping through the little joins. I heat embossed the sentiment onto the front and then placed a spoonful of sequins in the middle, ready to pop the front over the top. I love this rainbow striped paper from the Lawn Fawn Rainbow Paper Pack isn't it pretty, I have ordered another pack! I used a beautiful butterfly from the Simon Says Stamp Beautiful Day Stamp Set, black heat embossed and popped onto the front. and I finished the inside. I like to save card/paper wherever possible so I thought I would show you what I do. I have die cut a rectangle out of the middle of the pink card and then cover it up with the paper. I did the same with the striped paper so I have a lovely rectangle left to use on another project. 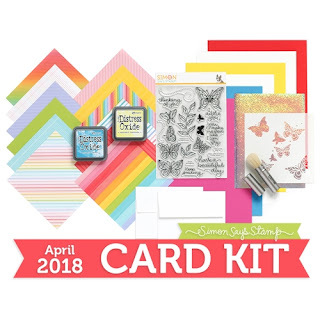 Not only does this save on you using so much lovely paper and cardstock, it also keeps the finished card more lightweight so cheaper to post!! and this is the kit in all its splendour ;-) I am so sorry that this kit has sold out already. Congratulations if you did manage to grab one, they really did sell like hot cakes! !